You can finally order burgers for breakfast at BK, but tragically not this one -- unless you're chilling in Penang, Malaysia. 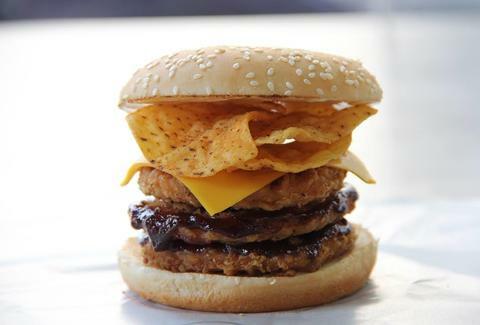 Cashing in on the buzz surrounding the new Godzilla movie, the Raksasa Burger comes with three patties (chicken or beef), BBQ sauce, mayo, and a heap of tortilla chips on top for added crunch. It's dubbed "raksasa" (which means "giant" or "monster" or "Lohan"), and represents a rare merger between the King of Monsters and the King of Burgers. Kristin Hunt is a food/drink staff writer for Thrillist, and is frankly shocked BK isn't doing this stateside with Doritos. Follow her at @kristin_hunt.